One of my favorite brands Artificial Flavor has been expanding into the men's clothing market and now sells many more articles of clothing instead of just underwear. They have some really cool jackets for sale. The reason I am bringing this up is because it may interest some of you. These stylish jackets normally sell for around $200 on their site, but now for a limited time they are available for $50. 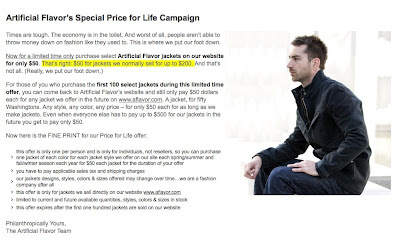 And even better still, if you are one of the first 100 to purchase the jackets during this limited time period, you will receive the $50 price for life! That's right, if you ever want a jacket from them again, you only have to pay $50, no matter how expensive they may become in the future. So this is a really great deal for all you stylish guys out there, and this could be a perfect gift for that valentine in your life.